1, The Intel CPU i5 is available to i5-4200U or i5-5250U 2 Cores, 4 Threads, 3M Cache. 2, This mini PC works with DDR3L RAM at 1.35V instead of normal 1.5V. 3, the default Operating System is Windows 10 Pro; please leave a message in your order to remind me if you need others, Optional: Windows 7, 8.1, Ubuntu. 4, it has been tested well before shipping, if any questions, pls contact us, you will get a satisfied solution. 1. 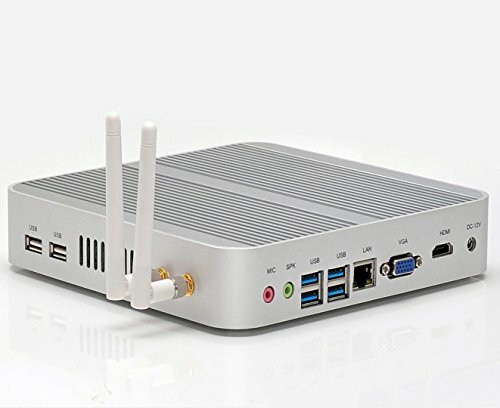 Special: 64 bit computing, Hyper-Threading technology 2.0, Virtualization technology; Support Wake-On-LAN, calls on function automatically; Support both mSATA and SATA Drives. 2, 2 RAM Slots; I/O port: VGA*1, HDMI*1, LAN*1, 4*USB 3.0, 2*USB 2.0. 2. Smart: Fanless system, smart design, zero noise, be able to work 24hrs continuously. 3. Slim: Only 4cm body thickness, brushed black alloy case. 4. Smooth: Support 3D games, blue-ray and HDMI HD streams. 5. Strong: Intel i5 CPU, 8GB RAM, 1TB SATA HDD. Fast Speed. Personal Computer, Factory, classroom, bank, supermarket, stores.